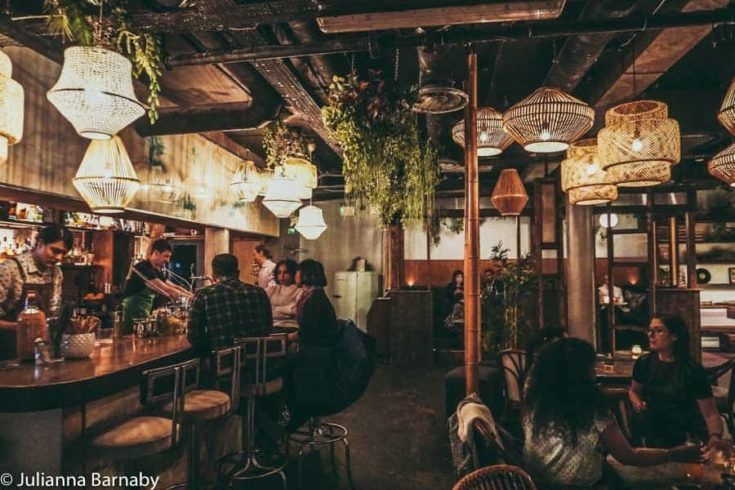 We love a secret bar in London. 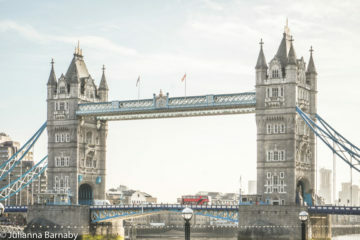 From Alice in Wonderland-themed bars to chic drinking dens where you can listen to jazz and sip on inventive concoctions, finding a hidden bar in London is a laughably simple task. 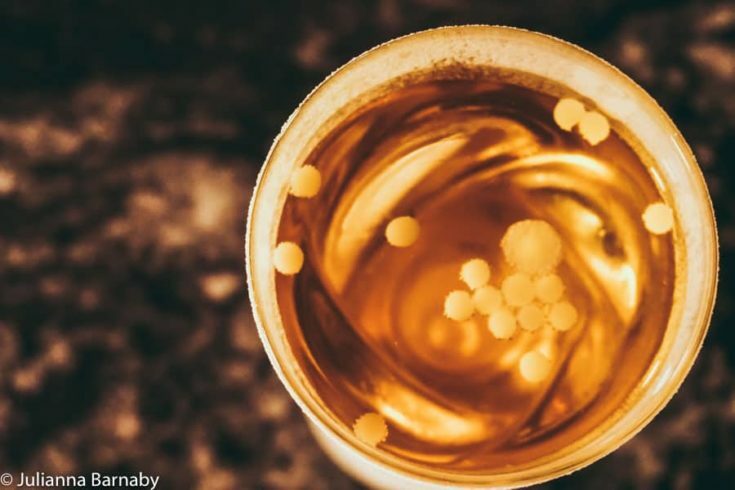 Finding the very best secret bars is a different matter entirely – these are the ones that you shouldn’t miss. 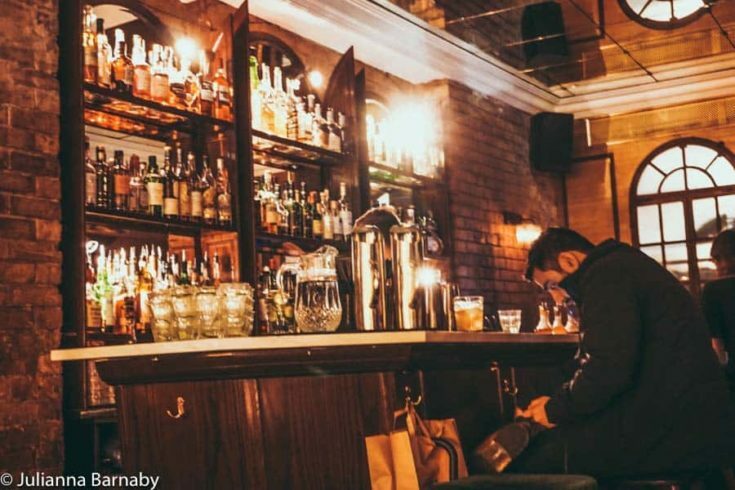 It’s no secret that us Londoners love a speakeasy. There simply can’t be any other explanation for the fact that each week seems to see a new hidden bar popping up somewhere in the city. Still. 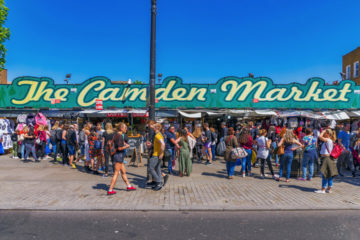 There’s a wide chasm between the hidden bars in London that blow your mind (and your tastebuds) and those that fail to live up to the hype leaving nothing but a hole in your wallet and a sense of disappointment in your heart. Skip the mediocre bars. 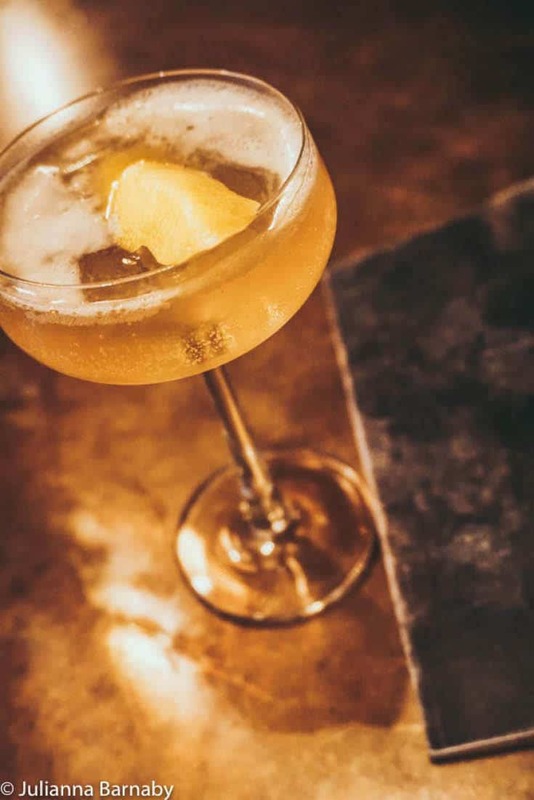 Here are 12 of the best secret bars in London that you need to add to your little black book. 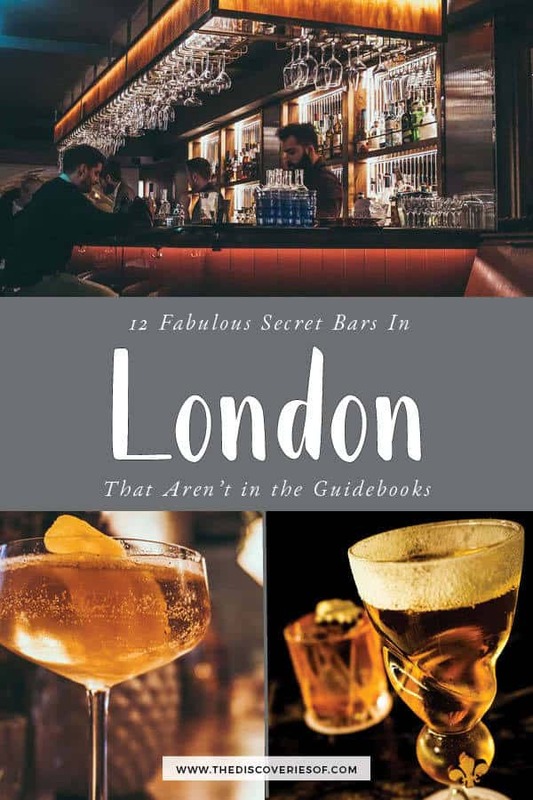 Drink your way around the best secret bars in London with this indispensable guide. Oriole is one of the best speakeasies in London. There’s nothing that this glamorous cocktail bar, hidden in the unlikely location of a transformed pub underneath Smithfield Meat Market in Farringdon, doesn’t excel at. 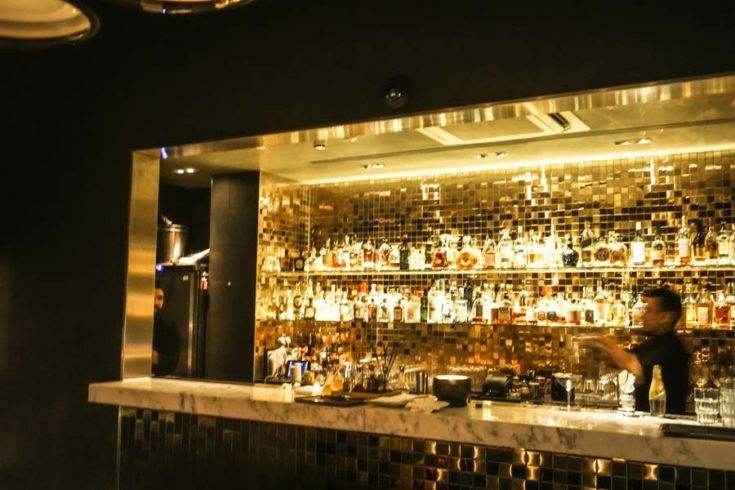 Whether that’s serving incredible cocktails made by mixologists at the top of their game or hosting a roster of cool live music gigs (largely jazz) - a trip to Oriole is an experience. One you’re unlikely to forget in a hurry. 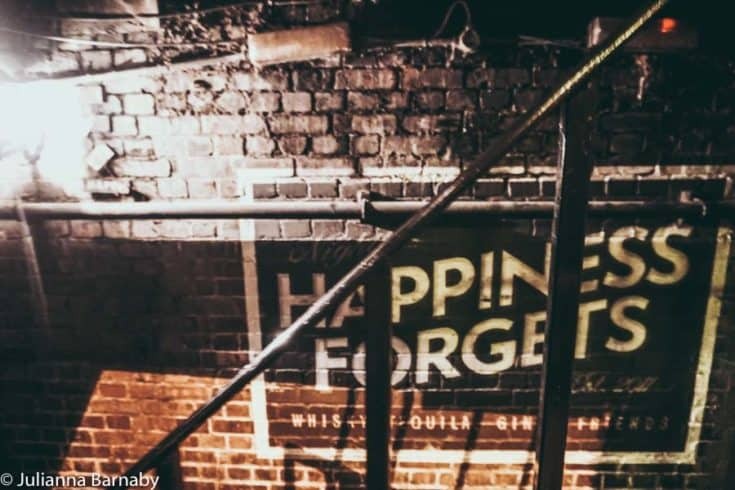 Get your elbows out or your booking fingers at the ready, Happiness Forgets is a secret bar in London, so naturally it’s no secret at all. What do you get when you combine a tiny cocktail bar with a lot of Londoners eager to imbibe its stellar cocktails? The answer is one of the hottest tables in town. All of that means that you book ahead, get there early or prepare to be disappointed. 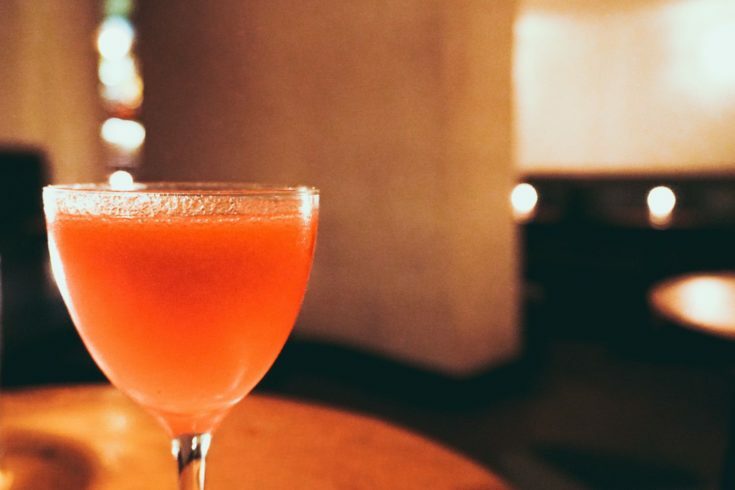 It’s worth the hassle though - the cocktail list, while small, is packed with the kind of palate-pleasing drinks you wish you could make at home but you can’t. Nine Lives might fly a little lower under the radar than some of the other bars on this list, but that doesn’t stop it from getting rather busy, even on a Tuesday night. What looks like a nondescript entrance across from the railway arches a little further along from London Bridge station reveals itself as a surprisingly large tropical-chic bar downstairs. 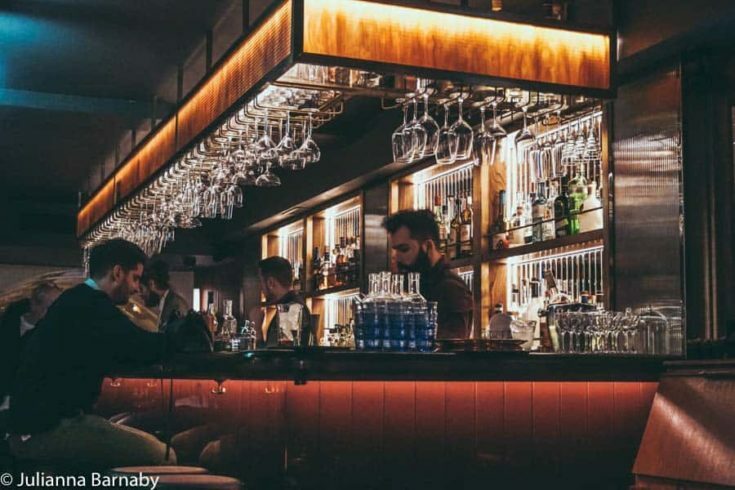 There’s a lot to appeal at Nine Lives - the interior, hand-picked playlists and not least the cocktails - a mix of classics and in-house inventions that will have you ordering drink after drink. It’s not likely that you’ll stumble across Found without knowing where to look. This hidden London bar is tucked away down a narrow flight of stairs. It’s not large, but what Found lacks in size it more than makes up in substance. 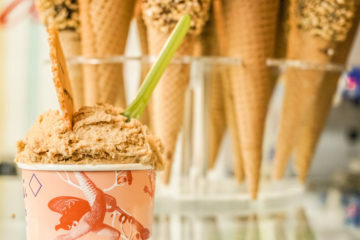 The small cocktail list features a changing lineup of seasonal drinks, each good enough to make you pause mid-conversation to take a second and appreciate it. Full of cosy nooks and candlelit tables, Found just so happens to be the perfect bar for a romantic date too. Not every secret bar in London has to be a speakeasy. 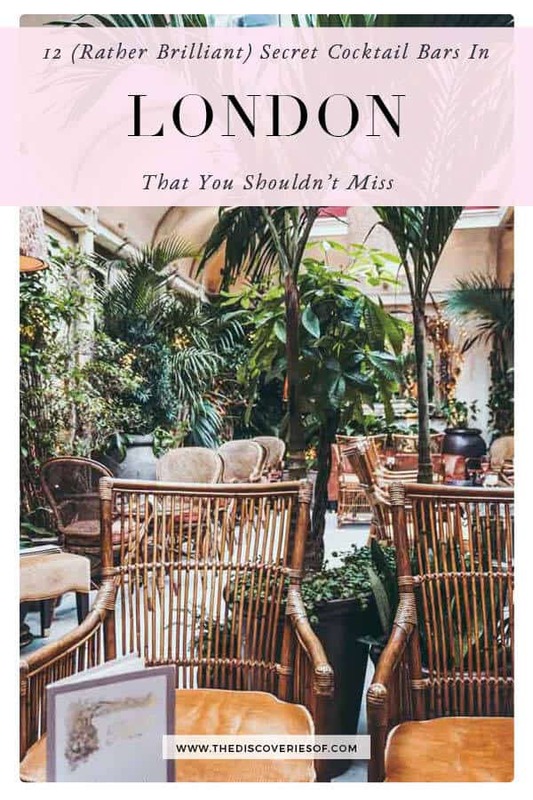 Rules is hidden upstairs and out of sight from the crowds that throng Covent Garden and its surrounds, making it the perfect place to take five (minutes or hours, you decide) to reset with a stellar cocktail in hand. The bar is impressive enough, but Rules’ new winter terrace is a jaw-dropping setting for your afternoon or evening libations. 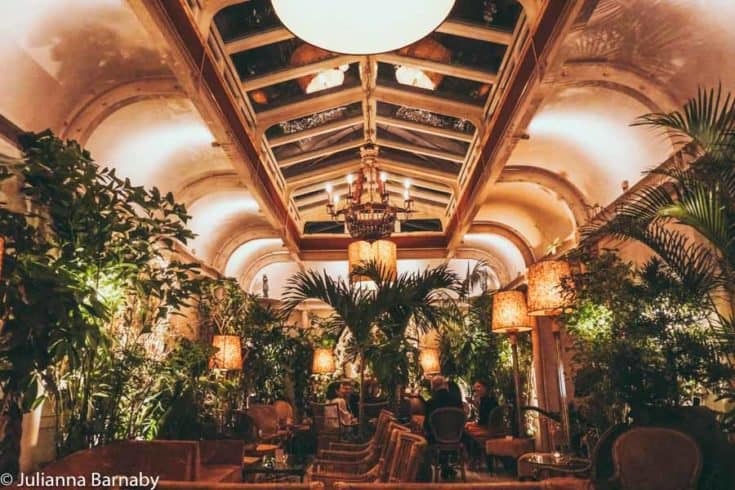 Filled with palms and all manner of indoor plants between which a selection of ridiculously comfortable seats are nestled - it’s the secret cocktail bar in London that you won’t want anyone else to know about. Disrepute by name, anything but disrepute by nature. 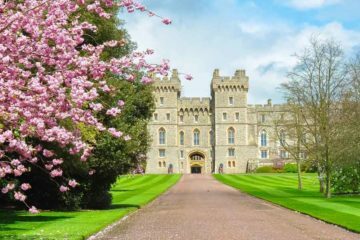 Disrepute’s tongue-in-cheek name may refer to the venue’s brow-raising past (it was the setting for the famous Profumo affair of the sixties) or the secretive after dark drinks that take place within its walls - it certainly does not refer to the quality of the establishment. An evening at Disrepute is not unlike those played out in Mad Men - Don Draper figures sipping boozy cocktails on plush velvet sofas. Yet somehow, it doesn’t take itself too seriously - with a playful menu and friendly staff contributing to the overall sense of illicit fun. Nip behind the tea counter in swanky St Martin’s Lane Hotel, your eyes searching for a door with a golden hand as its handle. This innocuous-looking hand is the gateway to Blind Spot, a secret London cocktail bar / irresistible drinking lair that may just result in a rather boozy night. Jazz aficionados shouldn’t miss the weekly live band - because we all know that cocktails and jazz go together like two things that… well, go together rather spectacularly. 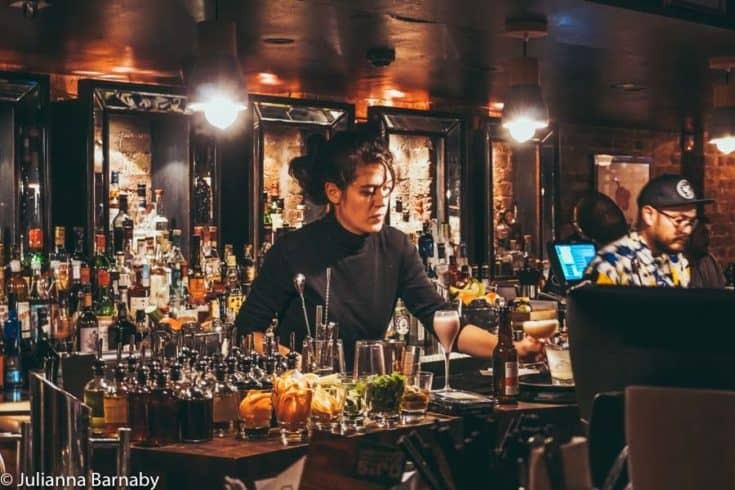 Yes, Nightjar is about as secret as Facebook’s tinkering in political events of recent years - but it’s so well known because it ticks all the boxes for the quintessential secret cocktail bar in London. First of all, there’s the place itself - a speakeasy in the truest sense of the word (if you suspend belief and transport yourself back to Prohibition America) - dark and moody, with live jazz most nights of the week. Then there are the cocktails. 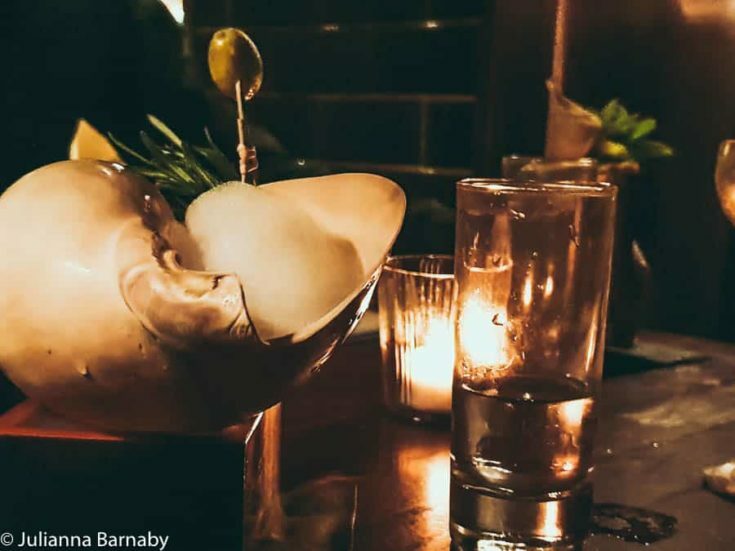 A few standard classics (albeit with a twist) are likely to be the only familiar faces in a cocktail menu that is part thrilling adventure, part code breaking exercise. Go along for the ride, it’s absolutely worth it. Immerse yourself into the fantastical world of Alice in Wonderland in Callooh Callay, one of Shoreditch's original speakeasies. The front bar is pleasant enough (with cocktails that merit exploring throughout the course of the evening. But that’s not the half of it. Make your way to the back bar (for which you may need a reservation) for a cheeky drink or two. 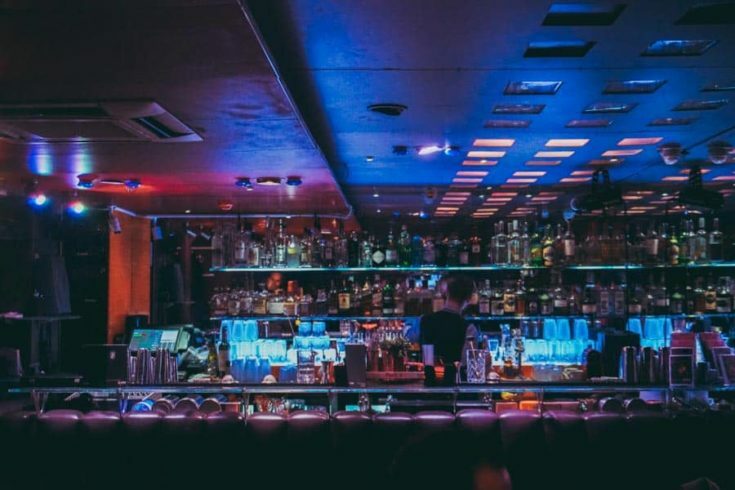 If you’re very lucky, you’ll be invited to make your way upstairs to the Jubjub Bar - a member’s only bar where the mixologists really go to town with the drinks. What happens when London’s cocktail power couple combine their respective superpowers to open a bar in Soho? The answer is Swift. Once upon a time, it was a difficult task finding a nice stiff cocktail in Soho. Those days are, praise be, long gone. In no small part down to Swift. There are two bars - the upstairs walk-in only bar serving lighter cocktails and snacks (think martinis and oysters and you’re firmly on the right track), and a lounge-style downstairs bar with live music. It’s hard to pick a favourite - the only reasonable thing for you to do is to spend a significant amount of time in both - by which point you’re unlikely to care about the answer. Is there any point in a speakeasy that’s near impossible to find? 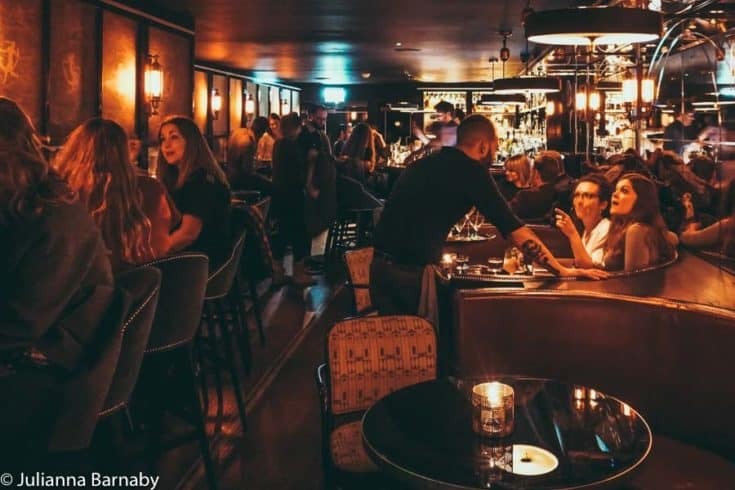 You’d never think it, but the answer is yes - drum up enough hype and serve a selection of exceptional cocktails in a congenial atmosphere and people will make it their business to get themselves into your bar. That’s the experience of the Experimental Cocktail Club anyway. 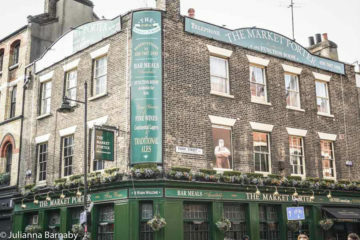 It’s a grand-dame in London years - it opened in 2010 back in the days when no one was going to Chinatown to drink cocktails. Yet it’s thrived - firmly maintaining its spot on any list of the best speakeasies. Let’s raise a glass to many years more. If there was a competition between the hidden bars in London for the weirdest location, CellarDoor would win. You can theme your bar all you like but the question we are really asking is this. Is your contender in a former public loo in Covent Garden. Not just any public loo, but toilets that used to have a rather risque reputation for attracting cottagers of the highest elite (including a reputed Oscar Wilde)? If the answer’s no, then pipe down because CellarDoor is the clear champion. Scandalous history aside, CellarDoor is a fun little bar - with burlesque and drag nights throughout the week and splendid drinks to go with.